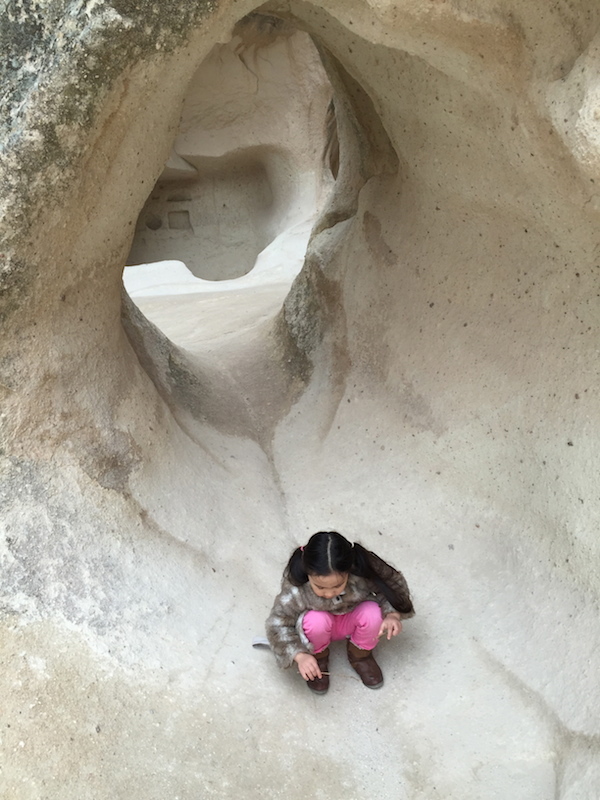 This open-air museum is a spectacular landscape that was entirely sculpted by erosion. 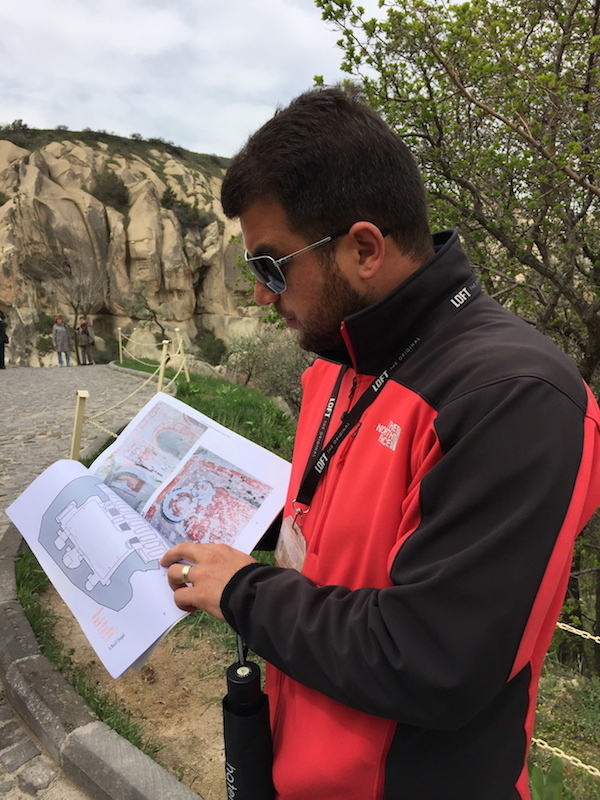 It is surrounded by rock-hewn sanctuaries that show unique evidence of the Byzantine period. 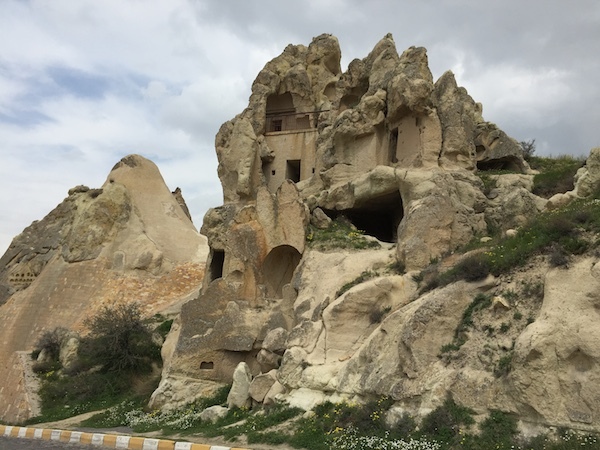 Cave dwellings, troglodyte villages, and underground towns—dating all the way back from the 4th century can be seen here. 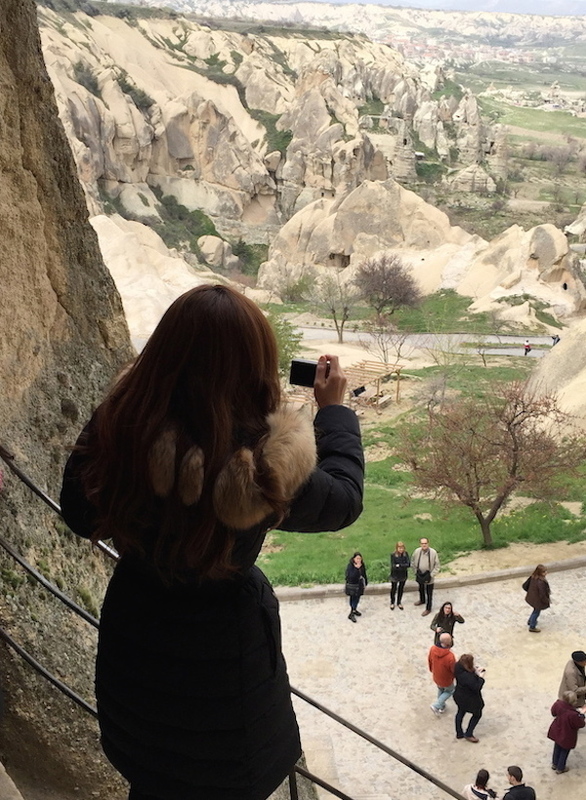 For this part of Cappadocia, we got a tour guide (who looks like a Hollywood actor, don’t you think?!) 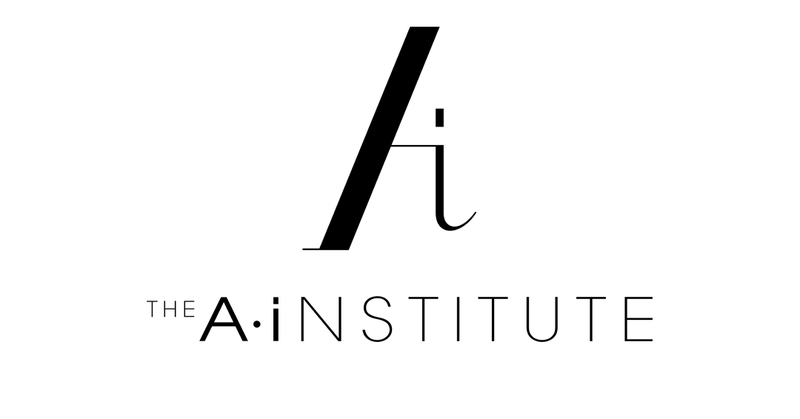 to help us better understand the rich history of this place. Having a tour guide is especially helpful when you are travelling with kids, who are always very curious and ask a hundred and one questions about the interesting things they see in a new place! 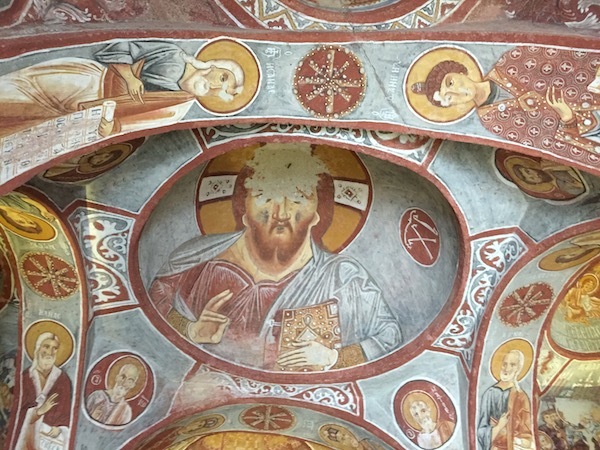 The Göreme Open-Air Museum resembles a vast monastic complex composed of old monasteries placed side by side, each with its own small and unique cave-like church. 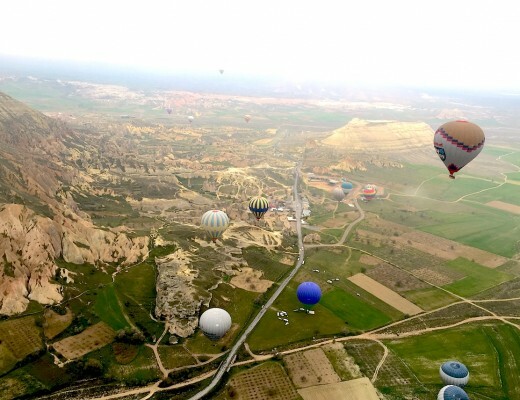 This is usually the first sight to be visited by any traveler in Cappadocia. This place presents unique examples of rock-hewn architecture and fresco (wall painting) techniques. 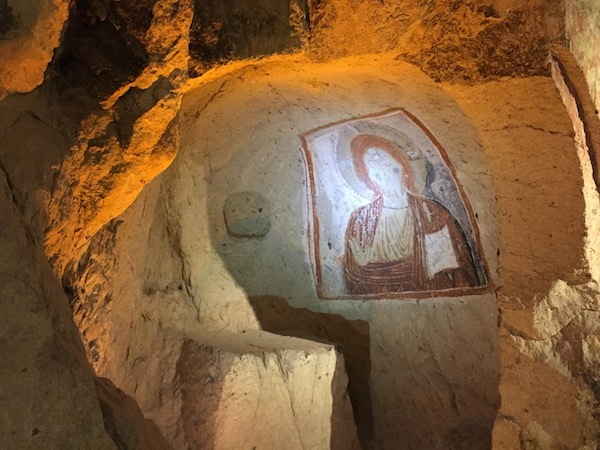 Its amazing history and rich art are what has made the Göreme Open-Air Museum a part of UNESCO’s World Heritage List. Look at the beauty of the wall painting inside their caves! 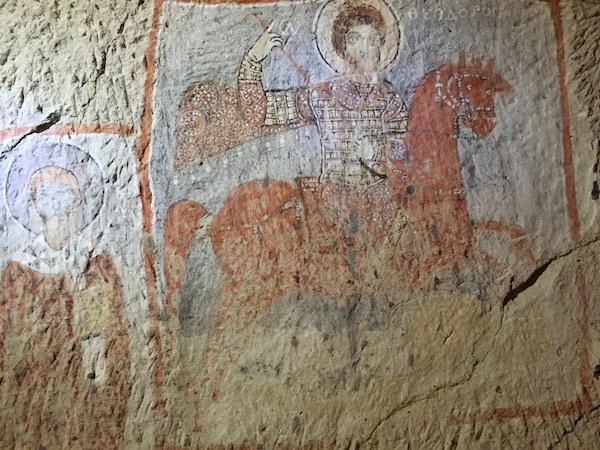 Their outstanding wall art (frescoes) is what makes Cappadocia one of the leading examples of the post-iconoclastic Byzantine art period. Isn’t it just amazing that the colors still retain their original freshness even though some of them are dating as far back as the 4th century? 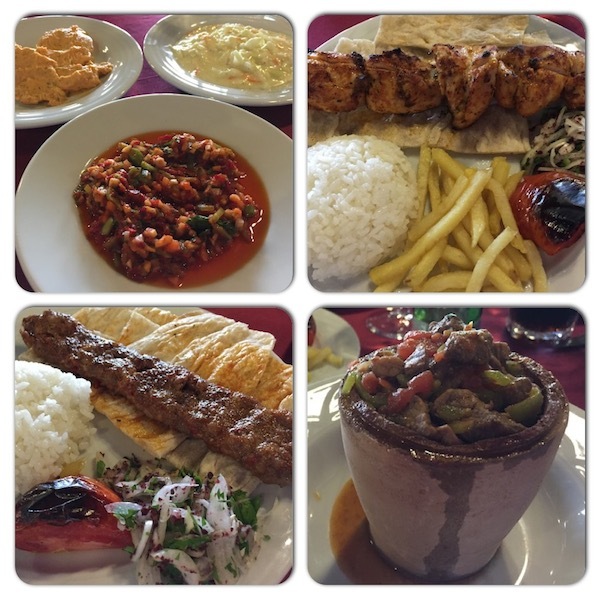 From there we headed straight to lunch in this simple Turkish restaurant by the roadside (the name is in Turkish so I can’t remember) that served us some of the most delicious chicken and lamb kebabs we’ve had in this trip. 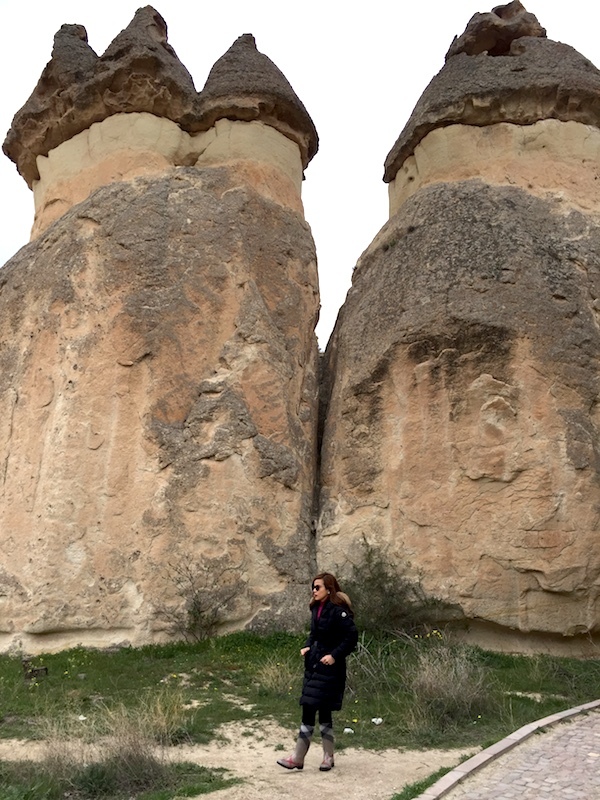 Straight from lunch, we headed to Pasabag Valley, the place where the “Fairy Chimneys” are standing. 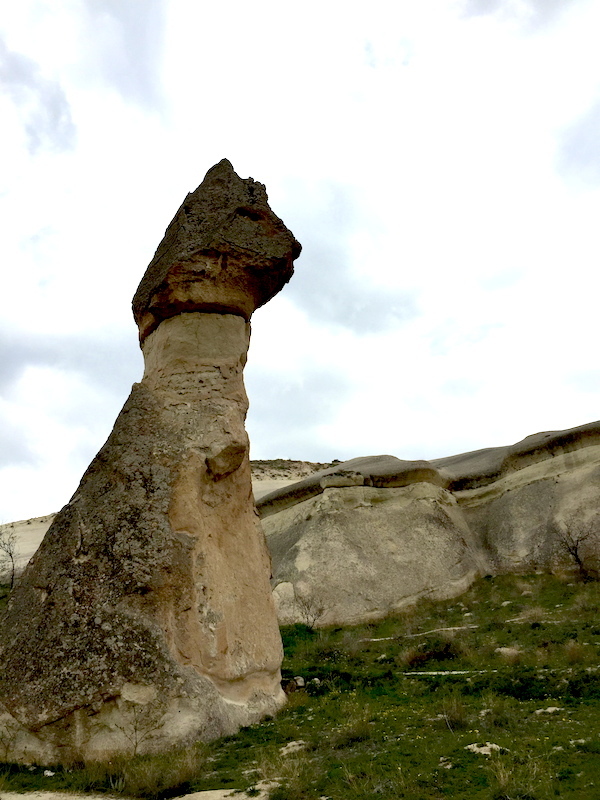 This valley is well known for their highly remarkable and unique earth pillars, which can be seen in the middle of a vineyard. 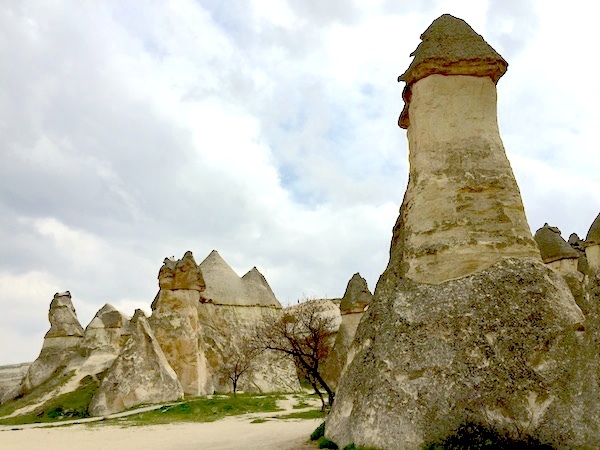 These “Fairy Chimneys” are probably the best known feature of Cappadocia. 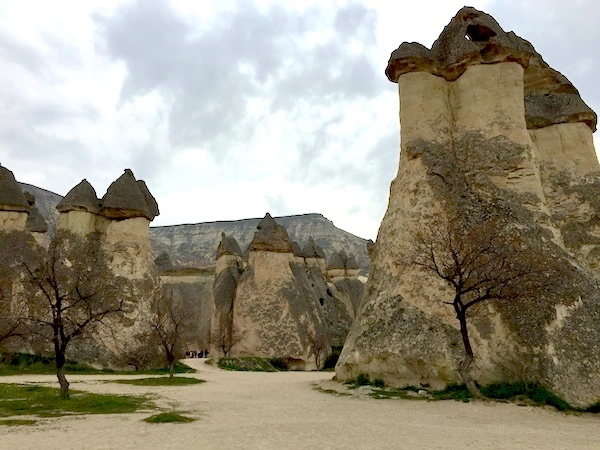 The whimsical name, as you can tell, was derived from these cones carved in tuff stones, which look like fairies from afar and which stand apart from each other. Some of these rock cones split into smaller cones in their upper sections, in which the stylites and hermits once hid. The landscape here is just naturally unique and beautiful. The whole place seems to have been plucked out of fairy tale books! 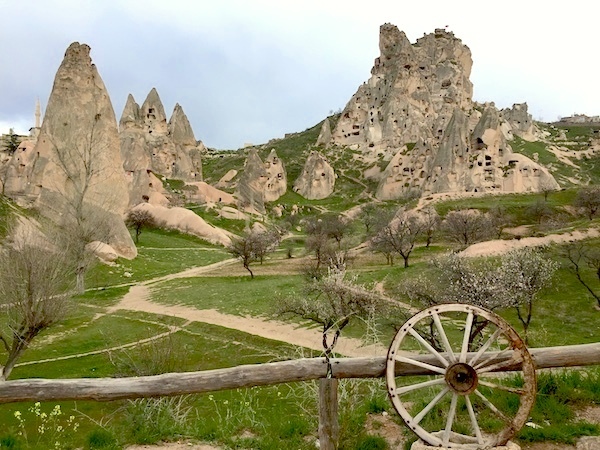 There are many valleys in this part of Cappadocia, but it is the Pasabag Valley that contains some of the most striking Fairy Chimneys—with twin and even triple rock caps! It is a big wonder how these sedimentary rocks were formed from volcanic material between 9 and 3 million years ago. They say it was through erosion, and by wind and rain, that caused these rocks to form into these tall minarets and pillars. 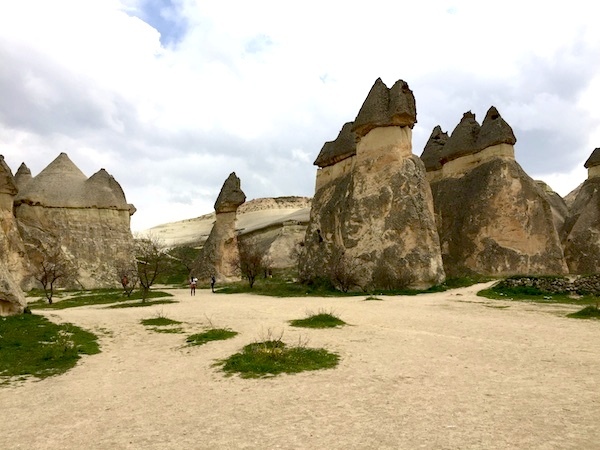 Just imagine that it is from these Fairy Chimneys that people back then carved their houses, churches, and monasteries—some of them dating all the way back to the Roman Empire. Seeing them up close was like being in another planet! These hundreds of volcanic rock formations that surrounded us left all of us in awe. 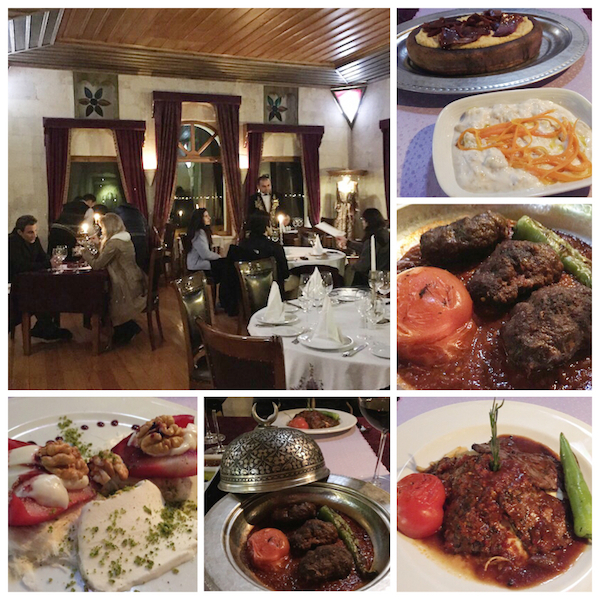 We then ended the day again with a hearty, delicious dinner back at the Museum Hotel. Hummus with pastrami, Roasted eggplant with yogurt and sauteed carrots. Grilled fillet steak slices with garlic yogurt, shoestring potatoes, tomato and basil sauce. 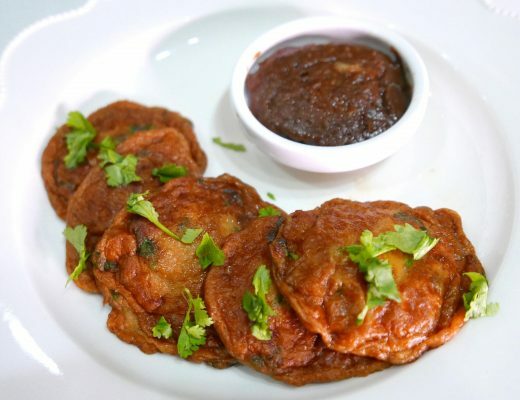 Chef’s spicy special meatballs served on spicy peppery tomato sauce. And dessert were slices of pears on traditional cotton candy served with traditional Maras ice cream. 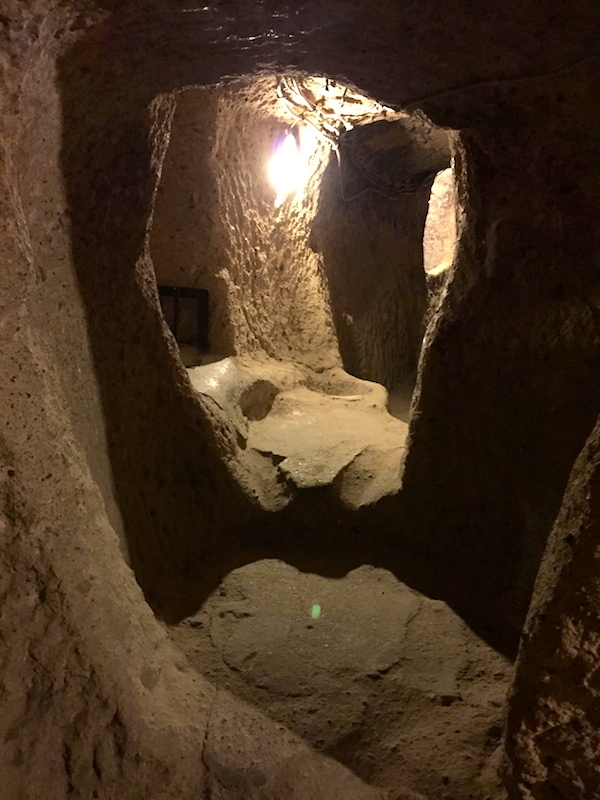 The next day was spent in an underground city. 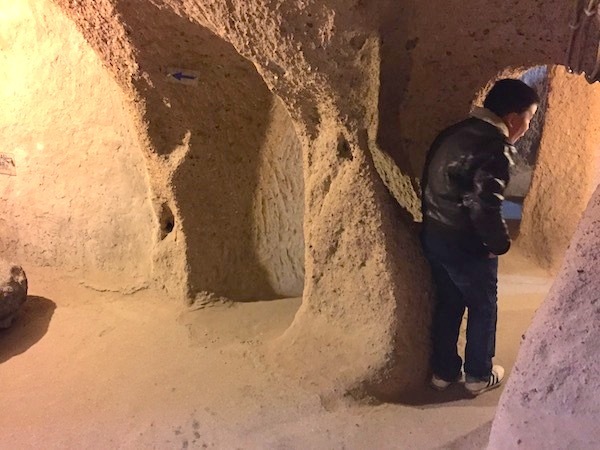 In totality, there are 36 underground cities in Cappadocia but the widest one among them all is the Kaymakli Underground City, and this was where we decided to go. 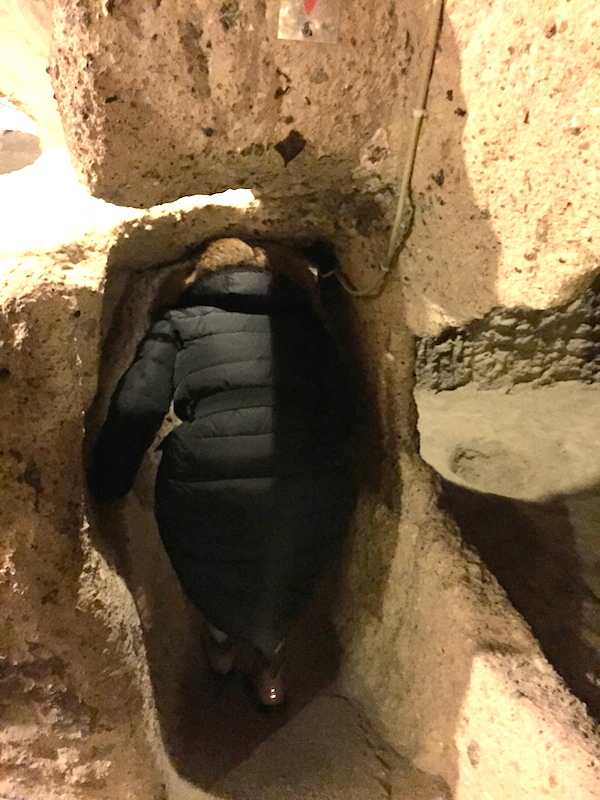 Here, my two boys were very excited as they crawled through tunnels that connected all the cave dwellings, squeezed through long and narrow passageways, and got dirtier than I’ve ever seen them in a long time! 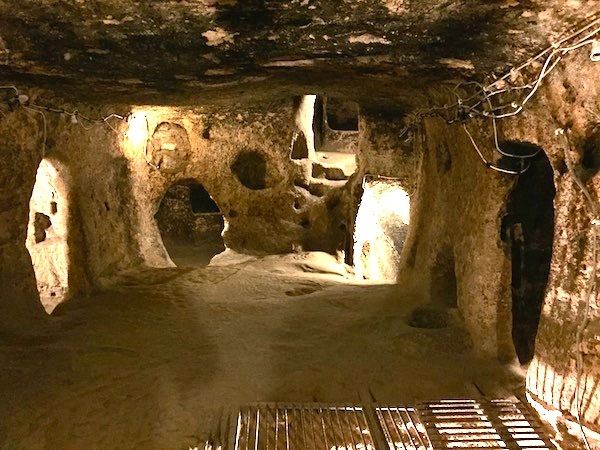 The earliest beginnings of these tunnels and chambers are unknown. But some archaeologists believe they were started by the Hittites way back in 1200 BC! 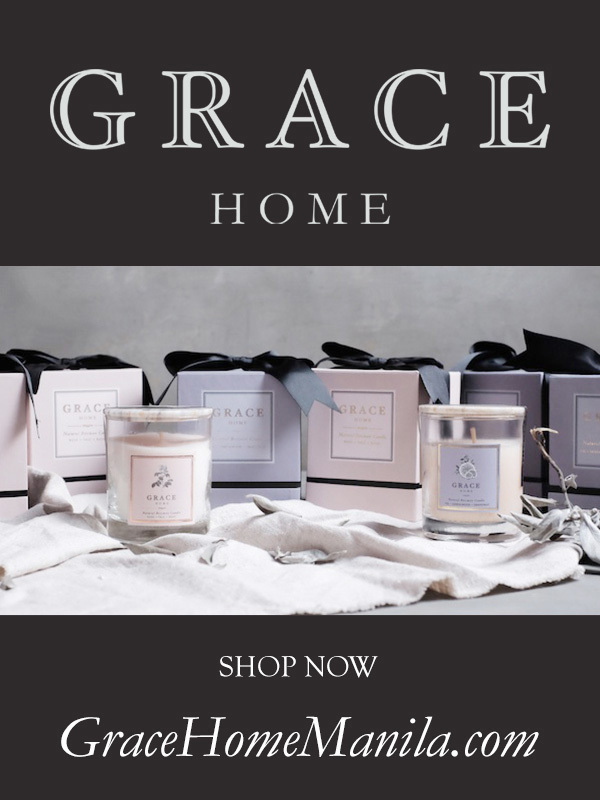 It is known that most of these levels were dug out by early Christians, as this provided them with their needed refuge from persecution, first from the Romans and then later from the invading Arabs. 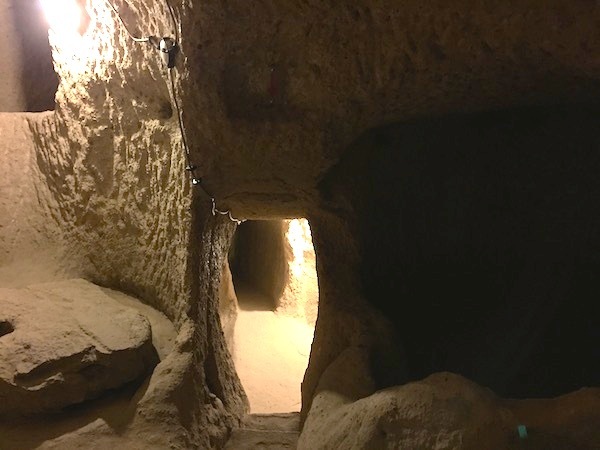 The Kaymakli Underground City has low, narrow, and sloping passages. While this place consists of 8 floors below ground, only 4 of them are open to the public today, in which the spaces are organized around ventilation shafts. The passageways here seemed endless! There were several places where us adults had to scrunch down while our kids simply walked through these low tunnels, without a slight bent over! 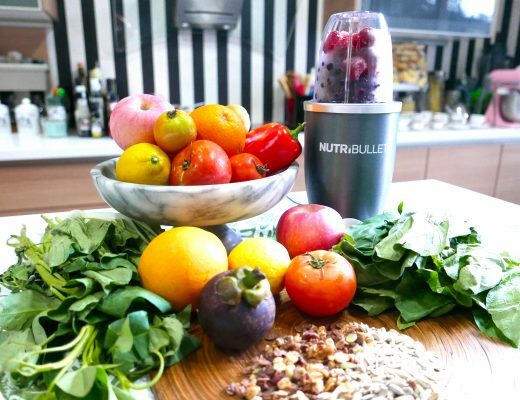 What can be found underneath? Each tunnel led us to an area that showed how the people back then used to live. There was a place for sleeping, praying, storing food, cooking, eating, and even keeping and hiding their animals. It was a real city underneath a city. 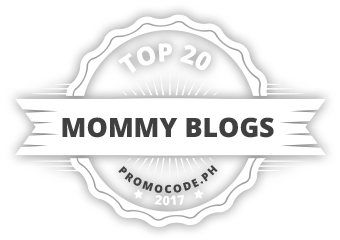 It was a place that both the kids and us adults enjoyed exploring! 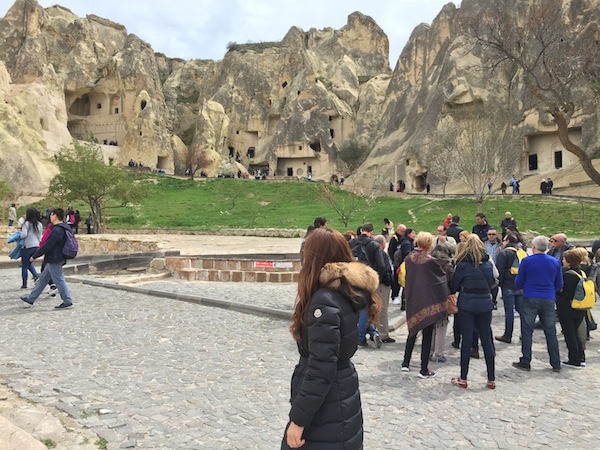 From the deep and dark Underground City of Kaymakli, it was good to be up and about walking in bright daylight again. 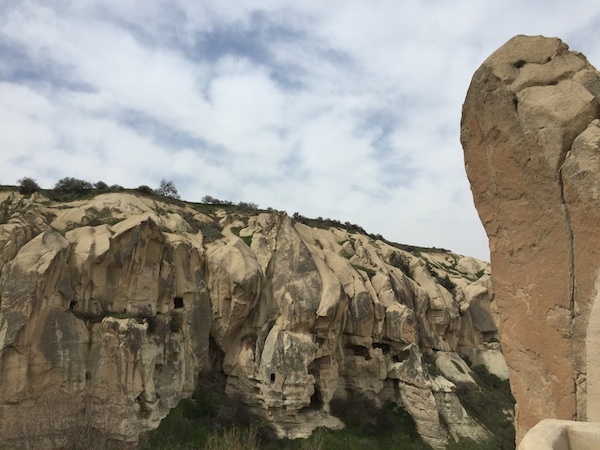 We proceeded next to the Uçhisar Castle which is situated at the highest point in Cappadocia, just 5 km from Göreme. The top of the Uçhisar Castle provides a magnificent panorama of the surrounding area with Mount Erciyes in the distance. 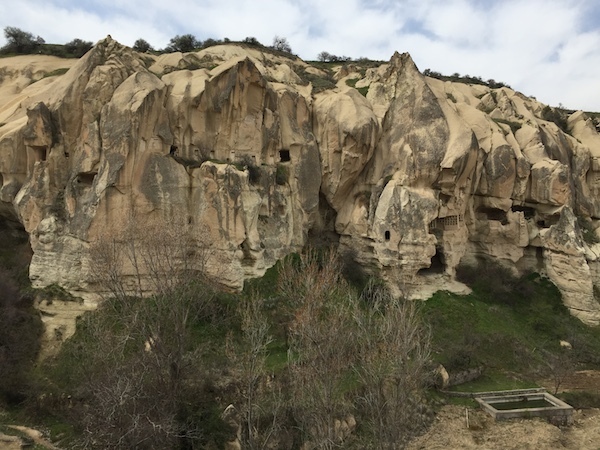 The Castle of Uçhisar is made up of many different caves that were carved into this tallest part of the rock. The rock itself was formed during prehistoric times and this was where the Hittites, Persians, and early Christians lived. 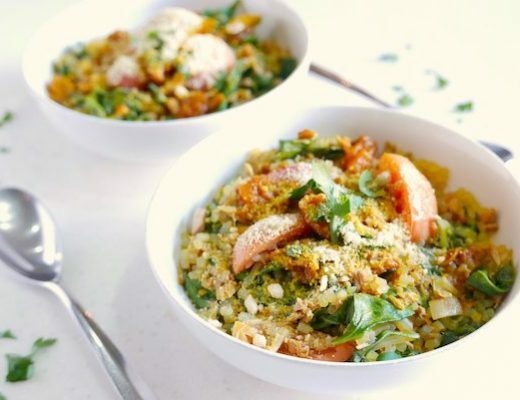 Whenever the people of Uçhisar were under attack, they would all run away and take refuge in the kale (castle). Because it was too high, the invaders would have a very hard time climbing up the steep mountain to get them! And more magic will unfold in our next and last leg of our trip to Turkey. So hang in there! 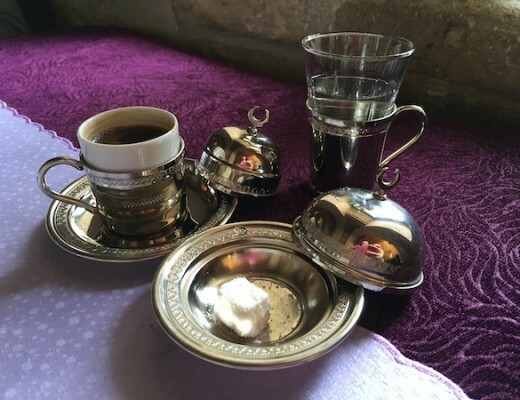 Also, read about my Favorite Things from Turkey. Wow!! The place is truly breathtaking. 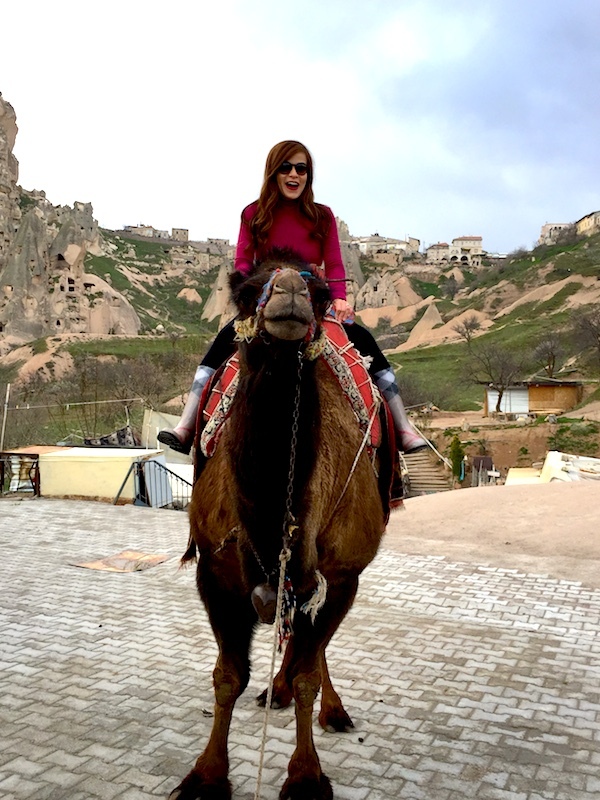 I will soon plan a Cappadocia visit. The pictures are impressive. 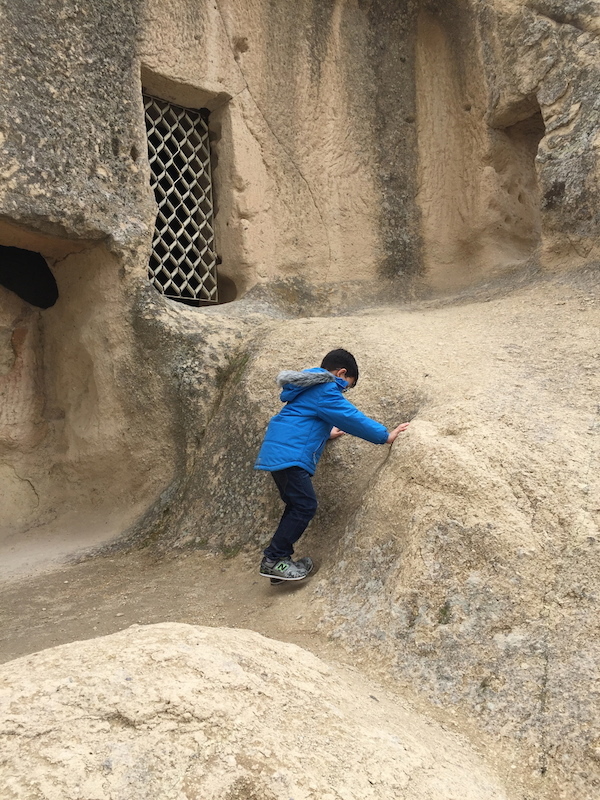 Your post has given me a sneak peak to Cappadocia. This has helped me to make my trip more enjoyable.